This Coffee and Cream Agar Dessert is a fantastic summer treat that is refreshing and unique tasting. 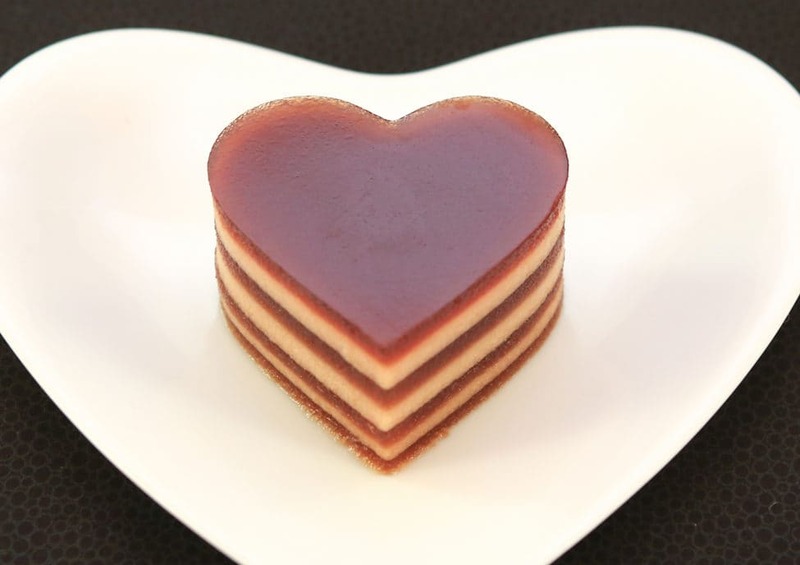 The recipe uses agar agar, a gelatinous substance derived from seaweed. 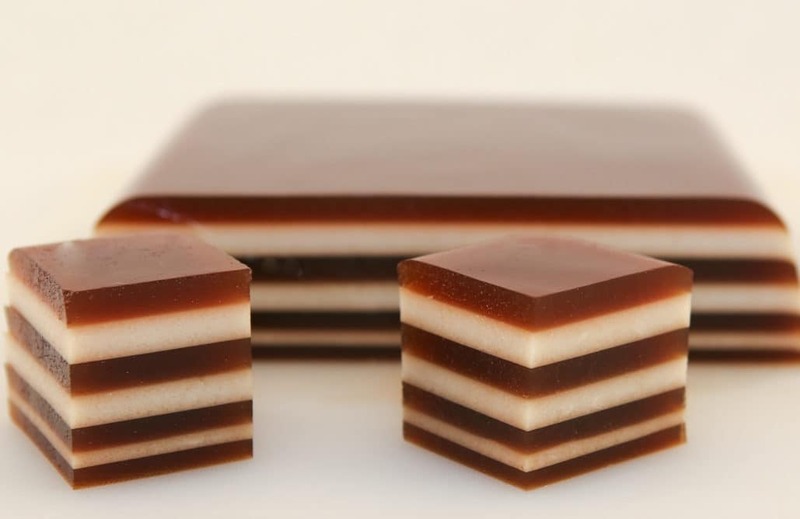 It’s similar to unflavored gelatin but has more of a crunch and is vegetarian. 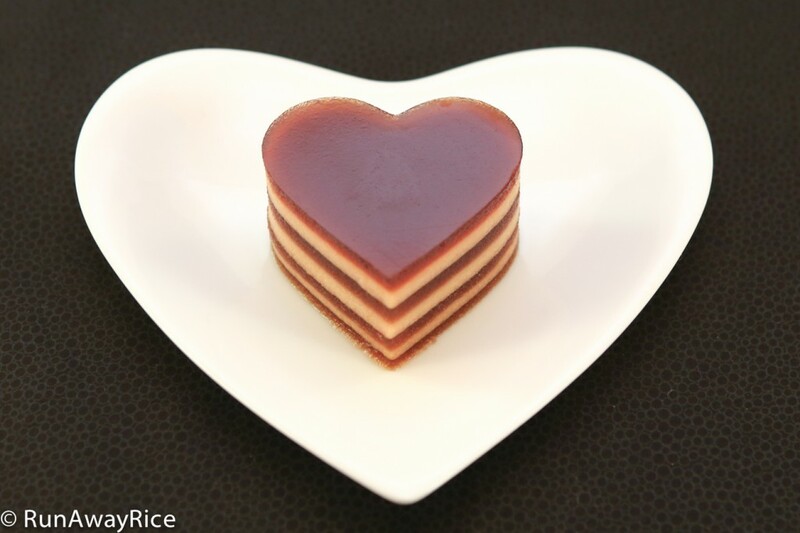 Agar agar is tasteless and so combines well with most flavors. In Asia, it’s a very popular ingredient in desserts. Depending on how much water is mixed with it, agar agar can create textures ranging from creamy puddings to solid fudge-like chunks. Ok, getting back to the dessert. It’s a bit time consuming to make because you have to make each layer individually and allow it to set slightly before starting the next layer. The key to making a successful dessert is timing the layers just right. If you wait too long between layers, they solidify and then you have a dessert with layers that just slide off one another. If you don’t wait long enough and the layer is too soft, the coffee and cream mix together. (But if this happens to you, don’t despair! See my post for Marbled Coffee and Cream Gelatin recipe.) So how do you time the layers just right? I use a rather sophisticated tool called my pointer finger. I lightly touch the jelly with my finger and it should be tacky but not wet and stick to your finger. This is the indication the existing layer is firm enough to hold the next layer. But, let’s say it’s your first time making this and you’re not exactly sure of the timing. I have another trick–keep the two mixtures simmering over low heat while you’re making the layers. The heat helps to glue the layers together. Other notes on this recipe, you’ll need two dishes. A larger one for the ice bath and a smaller one for the jelly itself. It’s best to use a shallow pan which allows the jelly to cool faster. In the video, I use a 9 1/4 inches by 7 1/2 inches dish. If you’d like, you can make the dessert in juice glasses, shot glasses or dessert dishes for even more visual appeal. Please note that I’ve adjusted the water in the recipe to allow for a bit of evaporation during the simmering process and you may have a bit of each mixture leftover. If you want you can mix the two together for an interesting top layer. 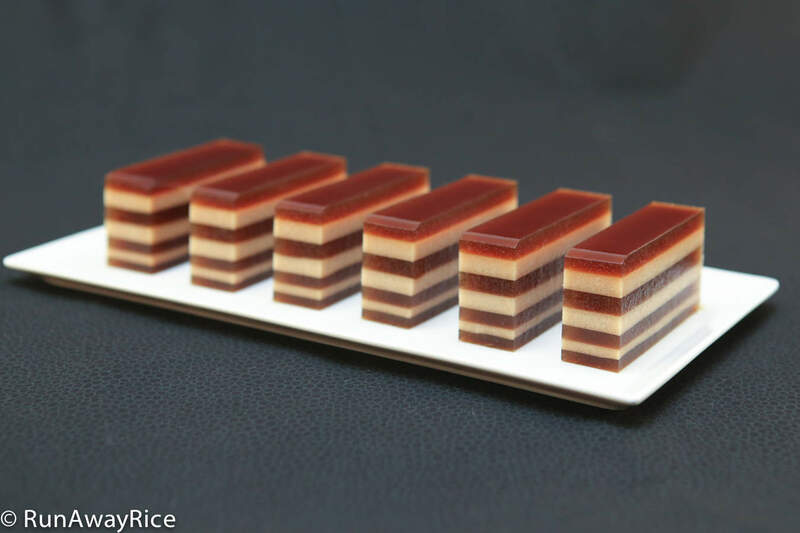 To serve this dessert, you can simply cut it into blocks and eat it with your hands. You can also dress it up by serving it on a plate with whipped cream and chocolate shavings. If you opt to serve it this way, I recommend putting some whipped cream on the plate and then placing the jelly on top. The dessert is quite slippery and may slide around on a plate without something to hold it down. Another great way to enjoy this dessert is to cut it into small pieces and add to iced coffee. Use a big boba straw to slurp up the coffee and jelly bits. (Oh Yum!!) I hope you enjoy the recipe! If you enjoy this recipe, you may also like: Vietnamese Custard (Banh Flan) and Chocolate Flan Cake. Add water into a medium saucepan. Sprinkle in the agar agar powder and whisk together. Allow to rest for 15 minutes. Mix instant coffee with hot water. Stir to dissolve. Add cold water to make 1 cup. Combine half and half and coconut cream. Add cold water to make 1 cup. Heat the agar agar powder and water over medium heat stirring constantly to dissolve. As soon as the mixture starts to bubble, add the sugar and stir until it’s dissolved. Use a fine sieve or spoon to skim the foam from the top and discard. Turn the heat down to low. Pour 2 1/2 cups of the mixture into a second, smaller saucepan. To the first saucepan, add the coffee and stir well. Add the cream mixture to the second saucepan and again stir together. Make sure both pans are now simmering over low heat. Place the smaller dish inside the large one and add ice so it’s surrounding the smaller dish. Pour in cold water filling the outside dish about 3/4 of the way full. Measure out 1 cup of the coffee mixture and pour into the smaller dish. The setting of the jelly varies depending on the size of your pan. The one I am using is 9 1/4 inches by 7 1/2 inches and each layer sets in about 3 minutes. Stir the mixture and measure out 1 cup of the cream. Using a large spoon, gently spoon the mixture on top of the coffee layer. Avoid pouring the mixture directly into the dish which could cause the existing layer to break. Optionally, pour the liquid over the spoon and allow it to drizzle into the dish. Continue making the layers until all 7 layers are made, 4 layers of coffee and 3 layers of cream. Be sure to stir the mixture each time before pouring into the measuring cup. Once the top layer sets, put the dish in the refrigerator and chill for at least 4 hours before serving. Serve cold. Is it possible to make this without milk or half and half? I’m lactose intolerant. Hi Jack, yes, you replace the half and half with coconut milk or water. Enjoy the recipe!